In this lesson, we will see more examples on how to divide fractions. Also, we will see how to make use of common factor to simplify the division. After learning the basics on dividing fractions, let's see more examples. 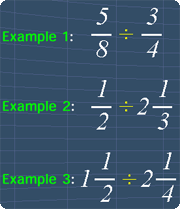 These examples will help us to have a better grasp on how to divide fractions. To find the reciprocal of a fraction, we just need to swap the numerator and denominator of that fraction. Then, change the divisor to its reciprocal. In this lesson, we will see more examples on how to divide fractions. Let's divide, 5/8 with 3/4. Here's how to divide fractions. First, we change the division sign to multiplication sign. We can do so, provided that we also swap the numerator and denominator of the divisor, 3/4, to get its reciprocal, 4/3. By doing so, we now have 5/8 multiply by 4/3. By multiplying these fractions, we have 5 multiply by 4, over, 8 multiply by 3. Notice that, we can simplify this before multiplying by dividing 4 and 8 with the common factor, 4. This gives, 1 and 2 respectively. Since there is no more common factor, we can continue to multiply. 5 multiply by 1, gives 5. 2 multiply by 3, gives 6. Finally, we have the fraction, 5/6. Next example, let's divide 1/2, with 2 1/3. Notice that, 2 1/3 is a mixed fraction. We need to change it into an improper fraction before we can continue. Multiply 3 with 2. This gives 6. Now, 6 plus 1, gives 7. This 7 becomes the improper fraction's numerator. Hence, we have the improper fraction, 7/3. Now, we can start dividing these fractions. We can do so, provided that we swap the numerator and denominator of the divisor, 7/3, to get its reciprocal, 3/7. After doing so, we have, 1/2 multiply by 3/7. Multiplying these fractions give, 1 multiply 3, over, 2 multiply 7. Now, 1 multiply 3, gives 3. 2 multiply 7, gives 14. So now, we have the fraction, 3/14. Final example, let's divide 1 1/2, with 2 1/4. Here's how to divide fractions. Since these are mixed fractions, we have to convert them into improper fractions before dividing. Let's start with 1 1/2. 2 multiply with 1, gives 2. Now, 2 plus 1, gives 3. This 3 becomes the improper fraction's numerator. With this, we have the improper fraction, 3/2. Similarly, let's convert 2 1/4 to an improper fraction. 4 multiply 2, gives 8. 8 plus 1, gives 9. This 9 becomes the improper fraction's numerator. So now, we have the improper fraction, 9/4. Alright, we can start dividing these fractions. First, change the division sign to multiplication sign. We can do so, provided that we swap the numerator and denominator of the divisor, 9/4, to get its reciprocal, 4/9. Now, we have 3/2, multiply by 4/9. By multiplying these fractions, we have 3 multiply 4, over, 2 multiply 9. Here, notice that we can simplify this, by dividing 4 and 2 with the common factor, 2. This gives 2 and 1 respectively. Similarly, we can divide 3 and 9 with the common factor, 3. This gives 1 and 3 respectively. Since there are no more common factors, let's continue the multiplication. Multiply 1 with 2, gives 2. Multiply 1 with 3, gives 3. Finally, we have the fraction, 2/3. That is all for this lesson. Try out the practice questions to test your understanding. You can start by going through the series of questions on how to divide fractions or pick your choice of question below.